Yesterday I ran out of cooking gas and in spite of having the gas registration or whatever it’s called, I had to run around like mad to get new refilled cylinder. BTW, I have still not got one because my address needs to be updated on the registration card. Anyways, that’s not important. I can’t really wait for another 4-5 days, which the due process requires. So, I decide to buy gas in black; we used to do that when I was studying in Delhi University because none of us had the gas registration. Buying LPG in black is always more expensive by 50%-60%. Most of the students who live away from homes buy gas in black market and so do the poor people, who can’t afford to get the gas registration done. Buying LPG in the black market also comes with another risk i.e. the risk of being cheated. Often you are cheated by the black marketers as they would never give you right quantity that a full LPG cylinder has, which increases the cost by additional 20%-30%. In most cases one pays 70% to 90% extra while buying gas from the black market. LPG cylinder in black market can cost you a bomb around the festival season when the LPG supply is limited and demand shoots through the sky. Taken from http://photos.merinews.com/upload/imageGallery/bigImage/1206709099336.jpg for educational purpose only. We might think that consumption of LPG through black market is very less but that’s not true. It’s a huge market network. I have only been talking about the metro cities here; the LPG shortage problem is much severe in small towns and villages. The Government of India has made it compulsory for the consumers to buy LPG through registered process only, which is a very wise step to curb the dishonest consumption of subsidized LPG. The LPG for domestic use is made available at a subsidized price. I am not sure about the exact amount of subsidy per LPG cylinder (my Google research suggests Rs 22.80 per LPG cylinder) is provided by the Government of India (from the tax payers money); according to a news report the Government is providing about Rs 2680 crore a year from the budget to subsidise mass-cooking fuels. The innocent consumer is ready to pay more for better service and speedy availability of LPG (along with so many other things in life). That’s why they pay more to these black-marketing people but bear all kinds of risks of being cheated. My Suggestion: The black-marketers buy the same LPG cylinder at a subsidized price from the government operated franchises (of Bharat Gas, HP etc.). They sell the same LPG cylinder to the end consumer for increased price making a hefty profit. 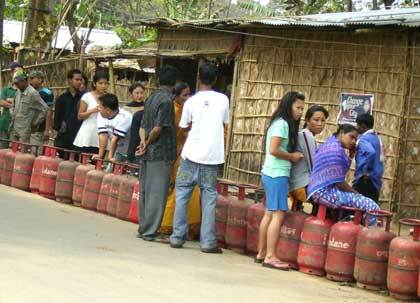 The government should make the LPG cylinders available without subsidy as well. The deal is that the LPG cylinders should be made available at a higher price (without subsidy) to the people who haven’t gotten the LPG registration done yet, and to the people like me who need it just anytime. So, the availability of LPG at an increased price and with better service (say 16 hours a day) would be quite profitable for the government. It cuts off the black marketers and reduces the subsidy burden of the government, and not to say, the relief for common man from all the hassles. I am sure some part (maybe a bigger chunk) of Rs 2680 crore a year can be easily covered with this scheme. ~ by pankajsingla9 on January 28, 2010. That idea sounds good. I hate to be negative about it but knowing Indian companies and the way we work, I suspect that the companies would then begin to supply less gas at subsidized rates and coerce customers into buying at normal price. Just like they do in ration shops. They say government food is not available but at normal prices or black market prices they are available. Another goal of subsidizing was to make available gas at cheaper rates for the majority of the citizens who still cannot afford it. But yes, with your suggestions atleast I ll be content knowing that the money will go to the company and not to black marketeers. The real problem with our policy makers is lack of intelligence. According to them subsidizing cooking gas is to help the masses but in the bargain the worst affected people are we. Instead the big business men enjoy the largest subsidy by spending initial capital expenditure and thereby their consumption charges are just a drop in the ocean. And on the other hand if you are not a listed consumer you ought to bear the monthly ordeal of paying extra buck to those delivery men. I feel besides the middle agents, these delivery boys are the biggest player and they garnered hefty sums in the pretext of short supply/ black marketing. As you rightly pointed these subsidies eat nearly billions of our treasury instead this sum can be utilized in some other public welfare programs. You have a point in your analysis so why don’t you file an RTI/PIL (whatever you say it in legal terms), maybe in future this small move from your end could prove vital to the entire nation.